I am a great fan of the Inside Out series. They give a great in depth view of the specific application. Take a peek at the book section and you will see that there are more book from the Inside series there. This one is the next step when you are done with the Access 2010 Inside Out by Jeff Conrad and John Viescas. This is a comprehensive book and together with this addition you are ready to tackle any database challenge with Microsoft Access. 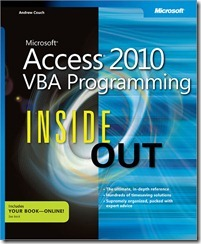 This entry was posted in Access, Books and tagged Access 2010, Access Programming, Free Sample Chapter, Inside Out, VBA on August 8, 2011 by Maurice.